As part of our ongoing quality monitoring programme, Russell Hobbs has identified a defect on a small batch of our white plastic 850ml travel kettles, model number 14178. The defect may cause the switch in the handle to overheat and in certain circumstances could result in a fire. The model number can be found on the underside of the kettle within a rectangular shaped label that also contains a five digit batch code. If you have a model 14178 kettle then you will also need to check the batch code, the location of which is shown in the diagram above. If the first three digits of the batch code start with the number 280 up to 365 and end in 14, or the first three digits start with the number 001 up to 240 and end in 15, then you have an affected kettle. IF YOU DO HAVE AN AFFECTED KETTLE, PLEASE STOP USING IT IMMEDIATELY. We will then advise you how to return your kettle for an alternative model* or a full refund of the purchase price**. 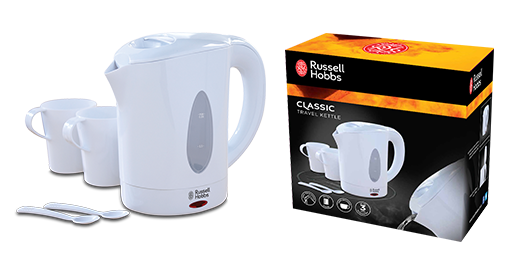 No other Russell Hobbs products or kettles are affected by this recall.